Join the Redwood Derby Club! Three (3) monthly winners will be drawn to receive $100 each beginning on May 22, 2018 and ending April 23, 2019! 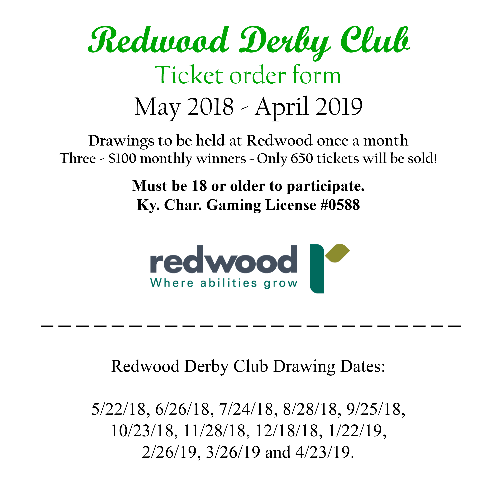 All Derby Club members will then be invited to Night at the Races in May of 2019 celebrate the close of the 18-19 Derby Club year with additional cash prizes given away! You can purchase multiple tickets Derby club tickets. Good Luck! 12/18/18, 1/22/19, 2/26/19, 3/26/19 and 4/23/19.